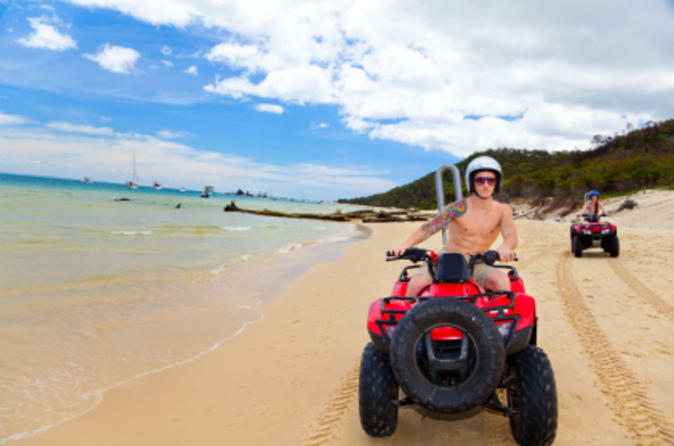 Explore Jost Van Dyke on the back of an ATV during this 5-hour tour from Road Town, Tortola. Bump down the rugged island terrain riding a 200cc Rally ATV to truly get 'off the beaten path' and enjoy spectacular views of the surrounding islands. Lead by an experienced adventure guide, this activity includes round-trip transportation from Road Town hotels. Ride on mountain trails and enjoy picturesque views! Following pickup from your hotel in Road Town, board a shared water taxi and set sail for Jost Van Dyke. On the short boat ride, enjoy being out on the open water and look for marine life. Upon arrival on the island, the smallest of the British Virgin Islands, meet your experienced adventure guide and listen to a short orientation and safety briefing. Once you feel comfortable, jump on to your 200cc Rally ATV and set off. Following your guide, bump down the island's dirt roads and when you get out into the country, leave the trail. Riding an ATV requires no prior experience, and the vehicles are built for off-roading. Make your way through the rugged terrain and lush tropical vegetation of the island's interior. Gun it up into the mountains for an adrenaline-fueled thrill ride. When you reach the top, stop for photo ops. Enjoy panoramic views of the surrounding British and US Virgin Islands dotting the turquoise sea. Make your way back to the departure point and hop back in the water taxi, returning to your Road Town hotel after a 5-hour adventure.